Cocoa Beach: If It’s Such A Great Idea………. Part 2. In our post the other day, we wondered “if the ballot question is such a good idea, why the need to lie about it?” Why lie about the particulars, the facts and the effects if the proposed ballot issue were passed? In that post we mentioned that a Political Action Committee (PAC) was pushing for the passage of the ballot question. We have questions about this group as well. PAC’s are required at least to register with what can be called “the lowest level of government” for the issue or candidate they are supporting. By that we mean while a group advocating for a local town council candidate could register with the State of Florida, because the candidate is not running state wide, the PAC can register with local town. Such is the case with this particular PAC as the ballot 1 question applies only to Cocoa Beach. With that accomplished, the “Protect & Preserve Cocoa Beach” PAC was set to go 13 days before the primary election which was held on August 28, 2018. Since that time, the PAC has put out signs, sent mailers, and purchased ads on Facebook. Political signs that you see along the side of the road during elections are not cheap. Any candidate can tell you that. A mailer to voters in the City of Cocoa Beach is not cheap. Ads on Facebook are not terribly expensive, but they are an expense nonetheless. Yet somehow this PAC managed to do all these things without spending a dime. Well, that is what they are telling the City and the voters at least. If there is no activity, (i.e. the PAC did not take in anything and did not spend anything,) the PAC files a “waiver” which is a the same thing as a report of no activity. That’s exactly what this PAC did multiple times. On September 6, 2018, the PAC filed a waiver with the City of Cocoa Beach saying there was no activity – no income or contributions and no expenditures – for the month of August, 2018. On September 21, 2018, the PAC filed another waiver stating there was no activity – nothing coming in or going out – for the period of September 1 to September 14. On October 5, 2018, the PAC filed a waiver stating there was no activity – nothing coming in or going out – for the period of September 15 to September 28, 2018. In their latest report on October 12, the PAC again filed a waiver saying nothing came in or went out for the period of September 29 to October 5, 2018. From the time the PAC was formed to the October 5, 2018, the PAC reported no activity. Nothing coming in. Nothing going out. IF THE PROTECT & PRESERVE COCOA BEACH HAD NO CONTRIBUTIONS AND NO EXPENDITURES, HOW DID THE SIGNS, THE MAILERS, AND THE ADS GET PAID FOR? There are lots of PACs out there who appear in name to be for one thing when in fact they are for the opposite. Perhaps some will say that it is acceptable because “everyone does it.” We never thought lying in cases like this was acceptable. We cannot wrap our heads around the idea of a group who lies telling people to trust them and their endorsement of anything. That makes no sense to us at all. Yet the bigger issue has to be the waiver reports. The PAC has stated it took in no contributions and made no expenditures, yet somehow managed to have signs printed, mailers sent out, etc. If you think about it, the people running this PAC should be hired by the City because according to their reports, they managed to have goods and services supplied without spending any money. Think of what that would mean to taxes if the City could provide goods and services without having a budget with income and expenditures. The chairperson and campaign treasurer shall certify as to the correctness of each report. Each person so certifying shall bear the responsibility for the accuracy and veracity of each report. Any campaign treasurer or chairperson who willfully certifies the correctness of any report while knowing that such report is incorrect, false or incomplete commits a misdemeanor of the first degree. The other day we said that the decision to support or oppose ballot question 1 is one that each voter must make. We still believe that. However, we also wondered if passage of the question was so good for the City of Cocoa Beach, why the need to lie about it? We don’t have any positive answers to those questions. If people and groups cannot be trusted not to lie or to follow the law, what does say about the issues they want you to support? As usual, great job in putting all this information together so the residents are informed before going to the polls. I was looking at the state database for political action committees and noticed that the Cocoa Beach Hotel and Motel PAC made a $1000 donation to this local PAC (on 9/19/2018) that also was not reported to the city in their financial reports. I plan to vote No, but even if I wasn’t, I sure would be skeptical about all the misinformation being pushed out by this PAC and candidate Tumulty and the attempts to hide who is behind these efforts. Even more disturbing is the Mayor at a recent commission meeting using his bully pulpit to advocate for this amendment by stating he was distributing signs from the PAC in question. If you really want to protect and preserve Cocoa Beach Vote NO on Cocoa Beach Question One. DANG! This must be some kind of ethics violation. There needs to be an investigation by the authorities. And by authorities, I mean someone not on the city of Cocoa Beach payroll. I noticed Jim Emory is listed as one of the originators of the PAC. He’s been burning up social media, trying to persuade people to get on board with his misleading “protect and preserve” propaganda. Not sure if the public has made that connection yet or not. So, we may not be able to “follow the money” due to lack of transparency and apparently, disregard for rules, but there are certainly enough signs that tell us who is behind this. The same hotel/development/real estate cartel that is always trying to overthrow the height limits we voted for. 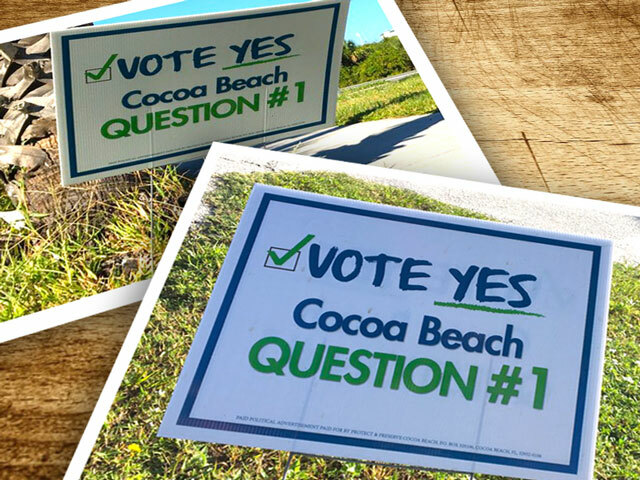 VOTE NO ON COCOA BEACH QUESTION 1! The difference this time is they are using very slick marketing tactics to spread misinformation. They’ve even got candidate tumulty pushing the misinformation (but at least his financial reports show he is supported mostly by special interests from mostly out of town). Unfortunately, I have had several intelligent folks say they thought they were supposed to vote for the amendment if they wanted to keep the 45′ height restriction because of all the misinformation. Residents who want to keep the current height restrictions at 45′ above crown of the adjacent road need to vote No on Question One. Remember question one means taller buildings, more congestion and additional stress on the Indian river lagoon that comes with additional development. Also, it is not enough for you to just vote No, you must get the word out to as many residents as you can and tell them to tell their friends so we aren’t hoodwinked by the special interest groups come election time.